JFC offer a range of Anti-Fatigue matting solutions which are designed to stimulate circulation in feet, legs and lower back. Circulation is stimulated by the unique surface profile which forces muscular responses, leading to a reduction in employee fatigue while in a standing position over long periods of time. One of the latest additions to our range of mat systems, this mat was designed and developed in conjunction with a world renowned industry specialist in the medical device sector. The EIRE mat offers a closed cell (non porous) surface mat system, making this mat one of the lightest to handle for a speedy turnaround on cell breakdown, cleaning and return to operational use within minutes as opposed to hours. The EVA material offers a comfortable underfoot anti-fatigue solution for operators working in cell and line work systems. 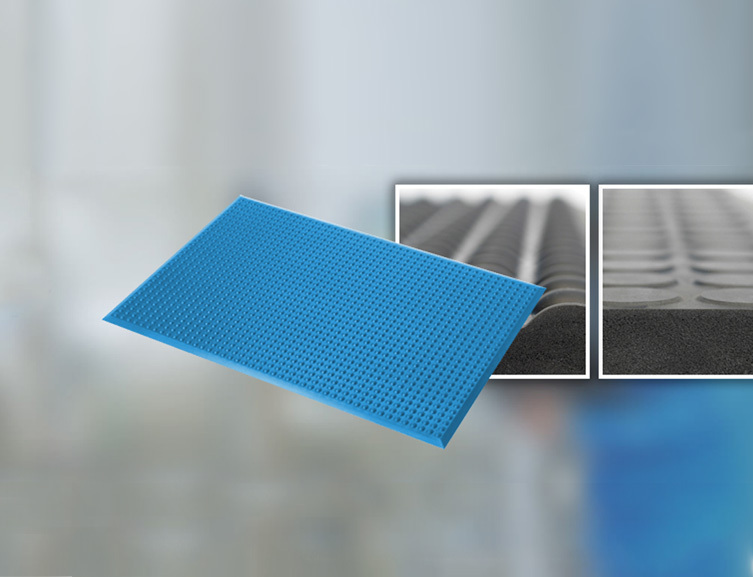 This mat also has antistatic properties for use where static electricity may be present. The infinity bubble is another true anti-fatigue mat available with up to a lifetime warranty (in dry applications). The infinity bubble mat has the comfort of a polyurethane mat and has the added benefit of easy clean-ability due to its closed-cell / non-porous top surface. The infinity bubble also has extremely good chemical and UV resistance (except for organic solvents). Ideal if carts or trolleys must be used. Cleanroom ISO Class 5 (Class 100). An anti-static mat that is ideal for dry and non-abrasive areas and where static electricity is present. Perfect for assembly and picking lines. Cleanroom ISO Class 5 (Class 100). This mat is for all dry and camp areas where flame retardant and anti-static material is important. Great chemical resistance for where chemical/oil spillage may occur. Ideal if carts or trolleys must be used. Cleanroom ISO Class 5 (Class 100). A less-dense version of polyurethane, complete smooth. Specifically for noncritical; environments of areas where durability is not of essence. Ideal if carts or trolleys must be used.